Should CEOs Waste time on 'Internal Meetings'? The Juggle, Worth It to Work Long Hours? How many hours should you be working? Breakfast Seminar: Community Assets and the Big Society - who carries the cost? What Do CEOs Do With Their Time? What do bosses do all day? Are CEOs More Effective as 'Mr. Inside' or 'Mr. Outside'. The Centre for Analysis of Social Exclusion tracked 200 families bringing up children in deprived neighbourhoods over ten years. The families told us a lot about their biggest worries and greatest needs. Streets and parks are unsafe; local facilities cost too much; energetic teenagers are not allowed to go further afield for fear of trouble so they often hang out on local streets. The thing families wanted most was for more for young people to do. Joblessness among low-skilled young people is extremely high in East London and other poor areas. Employers lose confidence and look for more highly qualified, more experienced and more privileged recruits, creating a vicious cycle for young people from troubled neighbourhoods. Families strive hard for their children, but young people need support. The riots this summer showed how fragile society’s hold is on community resilience, and how many parents fail to control or contain their young people. Most people brought to trial after the riots came from highly disadvantaged and fragmented urban communities. Iain Duncan Smith, Secretary of State for Work and Pensions, will talk about the importance of families to society; and explain how we can create better futures for our most disadvantaged children. Education, Sure Start for all ages, crime prevention, job training, outdoor space and youth activities all build community resilience. Professor Jane Waldfogel from Columbia University, a specialist in family and child poverty; and Professor Anne Power, author of Family Futures, and Head of LSE Housing and Communities will respond. For a transcript of Iain Duncan Smith's speech, please click here, and for a podcast of the event, please follow this link. We develop a model of electoral accountability with primaries. Prior to the general election, the supporters of each of two parties decide which candidates to nominate. We show that supporters suffer from a fundamental tension: while they want politicians who will faithfully implement the party's agenda in office, they need politicians who can win elections. Accountability to supporters fails when supporters fear that by punishing or rewarding their incumbent for her loyalty or lack thereof, they unintendedly increase the electoral prospects of the opposing party. Therefore, accountability decreases with the importance that supporters assign to the elections, and it breaks down in two cases. First, a popular incumbent safely defects as she knows she will be re-nominated. Second, an unpopular incumbent defects because she knows she will be dismissed even if she follows the party line. These behaviors are labeled impunity and damnation respectively, and are illustrated with case studies. "The Lesser Evil: Executive Accountability with Partisan Supporters" (with Erik Snowberg), forthcoming in Journal of Theoretical Politics. Session 2: How energy saving works? Session 3: How can we win the energy battle? Who pays? Who delivers? Can renewable energy do enough quickly enough? What are the barriers? How can we combat fuel poverty? Will the new ‘Green Deal’ work? Will energy companies really help? Why does retrofitting have a bad name? Why are renewables more fashionable than insulation? Is there such a thing as ‘magic wallpaper’? Professor John Hills, Director of the Centre for Analysis of Social Exclusion & leading an independent review of fuel poverty measurement for DECC. From October 2011, CASE researchers are starting a major new programme of work to report on the impact of the recession, spending changes and the government’s social policy reforms on inequality and poverty in the UK. The research, entitled Social Policy in a Cold Climate, will cover the period 2007 to 2014, examining the distributional effects of spending increases in the last three years of Labour government and of the recession and the Coalition’s policy reforms and spending cuts. The work is funded by the Joseph Rowntree Foundation, Nuffield Foundation and Trust for London, and will involve a team of researchers including Ruth Lupton, John Hills, Tania Burchardt, Kitty Stewart and Polly VIzard. Professor John Hills published the interim report of his independent review of fuel poverty on 19 October 2011.
a new approach to measuring fuel poverty, based on the overlap between low income and unreasonable costs and a fuel poverty gap, shows how badly affected households are. The report also includes questions for consultation. The consultation period closes on 18 November 2011. Details of how to respond to the consultation are set out in chapter 8 of the report. The final report of the review will be published in 2012. It will focus on implications for policy-making and delivery. The paper is joint work with Parikshit Ghosh and was published in Economic and Political Weekly of India, October 8, 2011, Vol. XLVI, No 41, it is available here. A shorter version can be accessed here. social justice nor the efficient use of resources. The Bill also places unnecessary and severe conditions on land acquisition, such as restrictions on the use of multicropped land and insistence on public purpose, all of which are going to stifle the pace of development without promoting the interests of farmers. We present an alternative approach that will allow farmers to choose compensation in either land or cash, determine their own price instead of leaving it to the government’s discretion, and also reallocate the remaining farmland in the most efficient manner. Our proposed method involves a land auction covering not only the project site but also the surrounding agricultural land. Oliver Vanden Eynde, PhD student at EOPP has won the "Banco de Portugal - Lisbon Meeting Best Paper Award" for his paper titled "Targets of violence: Evidence from India's Naxalite Conflict". This work was presented at the "Lisbon Meeting on Institutions and Political Economy". This is Oliver's second award, after winning the "Economic History Society New Researchers' Prize" for his paper "Military Service and Human Capital Accumulation: Evidence from Colonial Punjab" presented at the "2011 Economic History Society Annual Conference". You can find more about Oliver's research on his personal website. Please visit book’s website for more information and to download lecture slides and data related to the book. The paper is forthcoming in Quarterly Journal of Economics and can be found here. Abstract: This paper explores the consequences of improving property rights to facilitate the use of fixed assets as collateral, popularly attributed to the influential policy advocate Hernando de Soto. We use an equilibrium model of a credit market with moral hazard to characterize the theoretical effects, and also develop a quantitative analysis using data from Sri Lanka. We show that the effects are likely to be non-linear and heterogeneous by wealth group. They also depend on the extent of competition between lenders. There can be significant increases in profts and reductions in interest rates when credit markets are competitive. However, since these are due to reductions in moral hazard, i.e. increased effort, the welfare gains tend to be modest when cost of effort is taken into account. Allowing for an extensive margin where borrowers gain access to the credit market, can make these effects larger depending on the underlying wealth distribution. "Too many Meetings, too much time wasted," is a lament one often hears within top and middle management. Should CEOs even believe in meetings? After analysing the timetable of 94 European CEOs of major corporations, Prof. Raffaella Sadun of HBS' Strategy unit, in an April 2011 paper titled, What CEOs Do, and How They Can Do it Better, concludes, "The vast majority of a CEO's time, some 85 per cent was spent working with other people through meetings... while only 15 per cent was spent working alone. Of the time spent with others, CEOs spent on average 42 per cent percent with only "insiders"; 25 per cent with insiders and outsiders together; and 16 per cent with only outsiders. Likewise, time spent with insiders was strongly correlated with productivity increases. For every 1 per cent gain in time spent with at least one insider, productivity - for example, profits per employee - advanced 1.23 per cent. Less reassuring, however, was that the time CEOs spent with outsiders had no measurable correlation with firm performance." In this age, when the 40-hour work week is increasingly viewed as part-time, many of us are pulling long hours at the office. But at some point, all that time spent in the cube reaches a point of diminishing returns and it's worthwhile just to call it a day and head home. Determining that point, however, is tough, as Laura Vanderkam writes in a recent piece for Fortune.com. Vanderkam, the author of the helpful time-management book "168 Hours: You Have More Time Than You Think," examines the academic research on hours worked and actual productivity to try to come up with an answer. The study, which so far only has data from a group of Italian CEOs, found a strong correlation between the hours worked and the productivity of the firm; every one percentage point rise in hours worked meant firm productivity rose by 2.14 percentage points, Vanderkam writes. Students who are assigned STICERD desks are asked to make a full use of their office space and to take part in the centre's activities, including a weekly work-in-progress seminar series. They may also be asked to help out with other small tasks (up to four hours per week). If you wish to apply, please email a brief research statement explaining why you are interested in STICERD (no more than half a page) and a CV (including your marks at the LSE). In the CV, please include two primary areas of research interests (e.g., Development Economics and Public Economics). Please email this material to Henrik Kleven (h.j.kleven@lse.ac.uk) , Gerard Padro (g.padro@lse.ac.uk) and Mark Schankerman (m.schankerman@lse.ac.uk), with a copy to Sue Coles (s.coles@lse.ac.uk). Please send the material to us before Wednesday, 31 August 2011. When you do this, please let us know about your availability at LSE during the first week of Michaelmas term (Thursday, 29th September - Wednesday, October 5th) when we plan to schedule the interview. In particular, let us know if there is a day of that week when you cannot make it. Based on the feedback we get, we will choose a date for interviewing the prospective candidates. If we receive a number of applications that is larger than the number of available desks, we will select applicants based on their academic record at the LSE and on how close their research interests are to those of other STICERD members. ThRed supports research which combines theory and empirics, as well as research that is purely empirical but theoretically grounded: research which helps us choose between alternative theories, or stimulates further theoretical research. Our goal is to hold workshops, events, and host working papers and lecture notes, all geared to a methodological focus that is theory-oriented. ThRed has held several conferences in Development Economics, and plans to organize more. The ThRed website website will post news of conferences, and provide a respository of working papers and lecture notes. For more useful development economics websites and links please see the Useful Links section on the EOPP website. Tim Besley of the London School of Economics talks to Romesh Vaitilingam about the importance of a country's fiscal capacity and legal capacity for its development prospects - and the link to policy debates about 'fragile states'. The interview was recorded in London in June 2011 after a 'blue-sky' conference on development policy-making organised by CAGE, the Centre for Competitive Advantage in the World Economy at the University of Warwick. Download the programme, and further details for this event in Adobe PDF format. View presentations in Adobe PDF format. The UK Transport Research Centre is an exciting new initiative to encourage leading social scientists to contribute their expertise to addressing the challenging problems facing the future development of transport and travel in the UK. UKTRC is funded by the Economic and Social Research Council and is coordinating a programme of research, and a wide range of capacity building, knowledge transfer and engagement activities to facilitate greater dialogue between academics, practitioners, policy makers and the public. As part of a range of activities which will take place under the UKTRC banner, LSE Housing and Communities based within the Centre for Analysis of Social Exclusion (CASE) at LSE is running the third seminar of the series on housing and sustainable communities. The workshop series is led by Dr Karen Lucas (from the Transport Studies Unit, University of Oxford) and Professor Anne Power (from CASE at the London School of Economics). These workshops will be held every three months and each will focus on a different social issue that relates to the social impacts of transport and mobility that link social and transport policy. Each event will be led by a research institution with particular expertise in one of the areas. The Conference is being organised by Robin Burgess and Maitreesh Ghatak. It is aimed to bring together a selected group of researchers working on development economics, public economics and political economy, the core areas of the research program EOPP (Economic Organization and Public Policy). We look forward to generating discussions about the emerging research themes and ideas in these fields in the coming years, and to what extent there are important overlaps in the respective research agendas. The occasion is also to celebrate ten years of Tim Besley's tenure as Director of STICERD and also, co-incidentally, his 50th birthday. New York City Mayor Michael Bloomberg tells graduates in his usual commencement address that "it never hurts to be the first one in in the morning -- and the last one to leave." In last year's bestselling book Rework, 37 Signals co-founders Jason Fried and David Heinemeier Hansson complain about people who "try to fix problems by throwing sheer hours at them.... This results in inelegant solutions." Workaholics "aren't heroes," they write. "They don't save the day, they just use it up. The real hero is already home because she figured out a faster way to get things done." Bloomberg, Fried and Hansson are all successful people, so who's right? Up until now, there hasn't been too much data surrounding this question, but researchers at Harvard Business School, the London School of Economics and other institutions have recently begun an ongoing CEO Time Use Project to figure out exactly how work hours relate to success. Using time logs kept by CEOs' personal assistants, and looking across different cultures, the study asks how CEO time use corresponds with a company's performance. At this point, data is only available from a group of Italian CEOs of large firms. But according to Harvard's Raffaella Sadun, "we found this very strong correlation between the number of hours spent at work by a CEO and the productivity of the firm" (defined as revenue per employee) "and also the profitability of the firm." Every one percentage point rise in hours worked meant firm productivity rose by 2.14 percentage points. Rt Hon Margaret Hodge Member of Parliament for Barking. Anne Power, Professor of Social Policy, London School of Economics. Dr Katherine Rake Chief Executive, Family and Parenting Institute. Jane Waldfogel, Professor of Social Work and Public Affairs at Columbia University School of Social Work and a visiting professor at the Centre for Analysis of Social Exclusion at the London School of Economics. David Piachaud, Professor of Social Policy, London School of Economics (Chair). What challenges face families in poor areas? How are the challenges being met? This event will have wide appeal to people who work with, live in and care about families and low-income areas. David Halpern, Director of the Behavioural Insights Team in the Cabinet Office / No10, & Principal Advisor to the Office of Civil Society. Julian Le Grand, Richard Titmuss Professor of Social Policy at the London School of Economics. Neil Stott, Chief Executive, Keystone Development Trust. Download the programme, further details and application form for this event in Adobe PDF format. Many ideas about the 'Big Society' originate from the 19th Century when co-operatives, friendly societies and mutual aid were the survival strategies of the poor, underpinning families and communities in the face of harsh social conditions. In the current policy debates about how to compensate for essential cuts in public spending to reduce the current deficit, the 'Big Society' is supposed to help create stronger communities that can do more to help themselves without first turning to the state for help. In the 'Big Society', communities know how to organise local events and services, they are involved in running local schools, building and managing housing, raising funds for local causes and helping with children, families and young people in need of friendly, caring contact and support. This workshop will examine what mobilises communities to achieve social goals, looking at the critical roles of entrepreneurship, volunteering, co-operation and government. Is there something intrinsically co-operative about communities? Why is the idea of communities so lasting? Why does it recreate itself in so many forms? Why is the idea of profit-sharing activity common across different organisations, cultures, political perspectives and parties? If it is so common, why does it not happen more often? With the current climate change pressures and resource constraints, how can community activity and co-operative forms of organisation build great resilience?. This event is part of a celebration of 25 years on from the LSE project on Taxation, Income Distribution and Incentives run in STICERD by Sir Tony Atkinson, Mervyn King and Professor Lord Stern. The panel brings together a distinguished panel of experts to discuss what we have learned in the intervening period about how public policy can best be structured to support equity and growth. Energy shortages, unpredictable and high energy prices, waste, pollution, and fears of climate change all drive a sense of urgency in the West about reducing its energy dependence on unreliable sources. Europe imports over half its total energy from volatile producers around the globe. While the United States is able to meet somewhat more of its energy demand from domestic sources, its per capita energy consumption level is twice that of Europe's. The cheapest and most cost-effective path to greater energy security is energy saving, and the biggest, most certain place to do that is in our built environment, which in developed Western countries uses half of all energy and generates half of all greenhouse gases. Most of this energy usage is wasted by leaking out through walls, windows, roofs, floors, doors, and through inefficient equipment. All members of the European Union (27 countries) have adopted highly ambitious production targets for renewable energy, and equally ambitious reduction targets for CO2 emissions, down at least 20 percent from 1990 levels. Germany is leading the way in developing "green" technologies and has the most ambitious energy-saving program in Europe, aiming for a 30 percent reduction in energy usage by 2020, and a 30-percent renewable energy share, consisting mainly of biomass, wind, and solar. Information, promotion, and behavior change, working through regional and local bodies, developing enforceable standards through Energy Performance Certificates, and supporting model projects all over Germany. Since 2006, Germany has created nearly half a million new jobs in renewable energy, and over four years, around nearly 900,000 jobs in retrofitting homes and public buildings, such as schools. Green investment, new green technology development, and renewable energy exports are all major growth areas in Europe's strongest economy. By having taken these steps, Germany remains on track to meet aggressive greenhouse gas reduction targets by 2020 and 2050. Germany's experience - its successes and lessons learned - provide a solid evidence base from which nations like the United States can "leapfrog" Europe, and tackle even more pressing energy and climate change demands through deliberate public and private action. The widespread devastation of the German housing stock at the end of the Second World War resulted in the creation, as part of the Marshall Plan, of a remarkable bank: the Kreditanstalt für Wiederaufbau (KfW). The bank proved a most effective vehicle for lending, recovering and re-lending Marshall Plan funds for the reconstruction of German infrastructure and buildings. In subsequent decades the bank expanded and diversified its activities. The UK has a number of new policy initiatives related to the improvement of home energy efficiency, including the Green Deal, Energy Company Obligation (ECO) and, less directly, the Green Investment Bank. While the particular history and experiences of KfW mean that its approaches to home energy efficiency could not be transferred directly to the UK, nevertheless a comparison between conditions in the two countries shows that there are a number of important lessons from the activities of KfW that are relevant to what the UK is hoping to achieve. The Green Deal, Energy Company Obligation (ECO) and the Green Investment Bank are all welcome new policies in the right direction. But on the basis of the KfW experience, they do not go far enough on any of the key dimensions: the regulatory framework, the level of the financial incentive or the clarity of the message about integrating home energy efficiency and micro-generation using renewables for both electricity and heat. More will need to be done. In considering this, much can be learnt from what the KfW bank has achieved, how it has achieved it, and the overall policy framework that has supported these achievements. Obstacles and Opportunities is a short report based on what 200 parents told us over a ten year period of visiting them in their homes in low-income urban areas. We have produced three books based on this research: EastEnders: Family and Community in Urban Neighbourhoods; City Survivors: Bringing Up Children in Disadvantaged Neighbourhoods; and Family Futures: Childhood and poverty in urban areas (to be published by Policy Press in July 2011). The research that went into the three books informs this report but here we pull together a unique body of evidence and quotations. The particular focus of this report is on the opportunities and obstacles facing children and young people growing up in disadvantaged areas and the struggles of parents to overcome these barriers and build a better future for their families. We hope that this report will underline the sense of urgency about providing more, not less, for children and young people in disadvantaged areas. For these areas are still remarkably different from the average and the future of our society hinges on them becoming more equal and more integrated. The report is written by Anne Power, Nicola Serle, and Helen Willmot and is now available to download in Adobe PDF format. Using time diaries, a research team followed the activities of 94 CEOs in Italy over a week's time. They wanted to see not only how executives spent their time - a precious commodity, after all - but also to determine when they were most effective. Here are some highlights from the paper, What Do CEOs Do, written by Raffaella Sadun of Harvard Business School, Luigi Guiso of the European University Institute, and Oriana Bandiera and Andrea Prat of the London School of Economics. The more hours that the CEO worked with at least one insider, the more productive he was. The stronger the company’s governance, the likelier it was that the CEO spent more time with insiders. Time spent with insiders correlated with profits while time spent with outsiders did not. In sum, the team learned that CEOs who spent more time with employees inside the company were more successful than those who met with customers and other stakeholders outside the company. The members of the selection committee (Orazio Attanasio, Maristella Botticini, Luigi Guiso, Christopher Pissarides, Thomas Sargent, Guido Tabellini and Fabrizio Zilibotti) have announced that Professor Oriana Bandiera has been awarded the 2011 Carlo Alberto Medal, given to an outstanding Italian economist under 40. Details are at http://www.carloalberto.org/2011_winner.html. The National Health Insurance Scheme (Rashtriya Swasthya Bima Yojana, RSBY) aims to improve poor peopleâ€™s access to quality health care in India. This paper looks at the implementation of the scheme in Karnataka, drawing on a large survey of eligible households and interviews with empanelled hospitals in the state. Six months after initiation, an impressive 85% of eligible households in the sample were aware of the scheme, and 68% had been enrolled. However, the scheme was hardly operational and utilisation was virtually zero. A large proportion of beneficiaries were yet to receive their cards, and many did not know how and where to obtain treatment under the scheme. Moreover, hospitals were not ready to treat RSBY patients. Surveyed hospitals complained of a lack of training and delays in the reimbursement of their expenses. Many were refusing to treat patients under the scheme until the issues were resolved, and others were asking cardholders to pay cash. As is typical for the implementation of a government scheme, many of the problems discussed can be related to a misalignment of incentives. Download the programme for this event in Adobe PDF format. Obstacles and Opportunities is a short report based on what 200 parents told us over a ten year period of visiting them in their homes in low-income urban areas. social capital and community volunteering. We will discuss the way cutbacks will affect disadvantaged communities and what can be done to close the gaps in society that are widening. The National Communities Resource Centre provides training and support to thousands of residents and frontline organisations in low-income communities across the country to develop 'know-how', confidence and practical ideas for positive action within their local communities. It is the ideal base for our workshop because of its long-run Family Learning and Playing 2 learn programmes. Our workshops at Trafford Hall attract a wide range of policy and practice leaders, alongside community representatives, which bring together real expertise and experience. With heterogeneity in both skills and discount factors, the Atkinson-Stiglitz theorem that savings should not be taxed does not hold. In a model with heterogeneity of preferences at each earnings level, introducing a savings tax on high earners or a savings subsidy on low earners increases welfare, regardless of the correlation between ability and discount factor. Extending Saez (2002), a uniform savings tax increases welfare if that correlation is sufficiently high. Key for the results is that types who value future consumption less are more tempted by a lower paid job. Some optimal tax results and empirical evidence are presented. People at the very bottom of the economic ladder are often excluded, or exclude themselves, from microfinance. Their income is usually too low and unreliable to permit repayment of loans or investment in anything but basic food consumption. In some countries the very poor are served by safety net programs, which usually take the form of cash transfers, food aid, or guaranteed employment schemes. 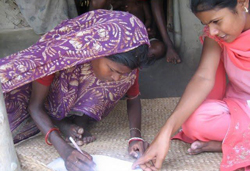 Starting in 2006, CGAP and the Ford Foundation have been exploring how a 'graduation model' can create pathways out of extreme poverty, adapting a methodology developed by BRAC in Bangladesh. The graduation model targets the 'ultra poor'- people who have no assets and are chronically food insecure. Safety nets usually help these very poor people survive but don’t allow them to build up assets. The graduation program combines support for immediate needs with longer term investments in training, financial services, and business development so that within two years ultra poor people are equipped to help themselves move out of extreme poverty. The term 'graduation' refers to participants moving out of safety net programs and 'graduating' into income-earning activities that let them sustain themselves without external subsidies. The graduation approach was originally developed by BRAC in Bangladesh. Over the past five years BRAC’s Specially Targeting the Ultra-Poor program has reached 800,000 households- over 70 percent of them are currently food secure and managing sustainable economic activities. Since, 2006 CGAP-Ford Foundation Graduation Program is helping to implement ten Graduation Pilots in partnership with local organizations in Haiti, India, Pakistan, Honduras, Peru, Ethiopia, Yemen and Ghana. The ten pilots involve diverse institutional forms, economic contexts, and cultures. Several of the pilots are measuring the program's effects on people's lives through rigorous randomized impact evaluations and qualitative research. This presentation will provide an overview of the graduation model and the pilot implementation. Syed M. Hashemi has recently moved to Bangladesh to set up the BRAC Development Institute. The Institute seeks to create south-south partnerships to develop practical solutions for the poor for economic transformations, gender equity and social accountability. Prior to joining the Institute Hashemi worked for CGAP (Consultative Group to Assist the Poor) in Washington DC. At CGAP he focused on identifying pro-poor innovations and disseminating best practice lessons related to poverty outreach and impact. Hashemi was amongst the pioneers who started the Social Performance Taskforce to promote a double bottom line in microfinance. He still continues to work for CGAP as Team Leader/manager of the CGAP-Ford Foundation Graduation Program, a multi-country program to develop new pathways for the poorest to graduate out of food insecurity. Hashemi has also been Director of the Program for Research on Poverty Alleviation at Grameen Trust and Professor at the Department of Economics in Jahangirnagar University. He holds a Ph.D. in Economics from the University of California at Riverside. BDI provides graduate training, promotes research and builds knowledge to address the challenges of poverty, inequity and social injustice. It brings together academics and practitioners to raise critical questions on development, develops new ideas and new strategies, pilot tests new initiatives, provides important lessons on good practices, and advocates for pro-poor policies. 9th February Housing and Planning Policy: Increasing Housing Supply? 16th March How will the Coalition's Social Policies affect London? Peter Kenway (New Policy Institute) on London's poverty profile. This event is sponsored by the LSE HEIF 4 Bid Fund, EAGA and by British Gas. How can we supply sustainable, renewable energy at community level? How can we reduce energy demand? How can we conserve water and reduce waste to zero? How can we make existing places so attractive that greenfield building becomes an even smaller goal? The Sustainable Development Commission, with backing from CLG, DECC and the HCA carried out a fascinating study, showcasing learning from over 80 model community projects around the UK. LSE Housing and Communities will host this productive workshop to discuss the successes and difficulties communities face in developing greater resilience, given the localism agenda and the energy imperatives confronting us. Many social landlords are paving the way in addressing community infrastructure needs and this workshop will tap into the latest knowledge and experience of those working around the UK on community level renewal , and will push forward the beacon ideas that arose from the SDC study, looking at how the voluntary, and community sector can contribute alongside policy makers and practitioners in a climate of austerity, energy uncertainties and social pressures. We hope to develop an action plan of what needs to happen next. The workshop will be practical, delivery-orientated and focused on the importance of local upgrading of neighbourhoods across the UK. It will consolidate current knowledge, and develop and present detailed case studies to show the relevance and potential of the Community Infrastructure Reinvestment approach. It is particularly timely with the government's strong focus on neighbourhoods and devolution of control. Why is community infrastructure so vital to our survival and so important to energy saving? What are the core ingredients of community infrastructure? What sustains a sense of place? How can we adapt community infrastructure to current environmental and social need? What role can communities play? What practical policy options do local authorities, housing associations, energy companies and government have?